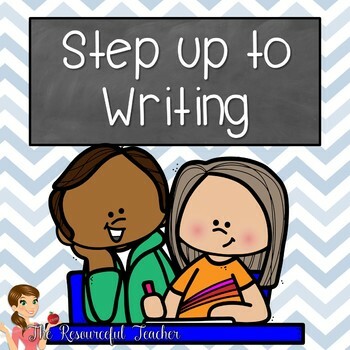 Want to learn Step up to Writing or understand and teach other teachers how to use it in their classrooms? 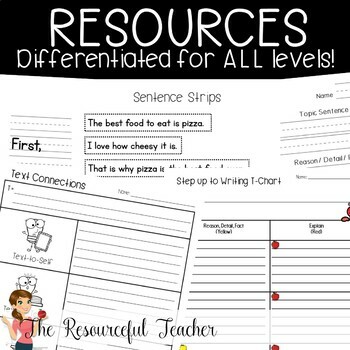 This Step up to Writing Resources product by The Resourceful Teacher is set up as a .pdf presentation for use in learning Step up to Writing or teaching Step up to Writing from grades kindergarten through middle school. The presentation shows how Step up to Writing builds year after year for students in each grade level. Not only does it teach this writing process, but it includes Step up to Writing posters, student samples, teacher bulletin board samples, cheat sheets/references pages students can keep in their desks, writing pages, graphic organizers, and grading rubrics! 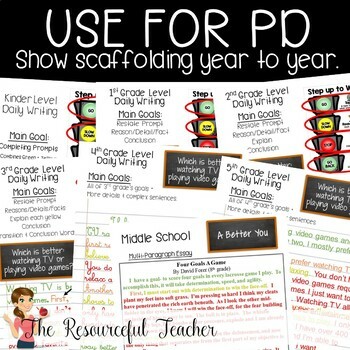 This resource is intended to enhance your EXISTING Step up to Writing* tools and curriculum, not to replace it. *Now with color AND black and white pages!!! **STEP UP TO WRITING format is not owned by me, nor am I affiliated with the company in any way. - Science Units Bundle - Examining Cells, Classifying Fingerprints, Sound, and more! - Tale of Despereaux Unit - ELA Reading Comprehension , Vocab, and more! ALL NEW PRODUCTS DEBUT AT 20% OFF FOR MY FOLLOWERS! Look for and click the ★ GREEN STAR ★ next to my store logo at the top right corner of this page to become a follower. This will allow you to be notified each time I debut a new product or FREEBIE! Have you ever thought of selling your own products on Teachers Pay Teachers? CLICK HERE to sign-up and start making money!